The Greater Decatur Chamber of Commerce was chartered on July 3, 1903, but traces its roots back to the 1887 formation of the Decatur Board of Trade. The chamber is recognized as the second oldest chamber of commerce in the state of Illinois and celebrated its 125th Anniversary in 2012. As the "Voice of Business", the chamber is proud to promote opportunity, growth and prosperity in local commerce. Strengthen the Local Economy and Business Profitability | The chamber helps local companies grow, retain business, and create a strong local economy. As a member-driven organization, the chamber builds the community by bringing the right people and organizations together to solve problems, address needs, discuss community projects, and to foster the strength of member organizations. Whatever is needed to advance the progress and welfare of the community, its image, and the local economy—the chamber is there. 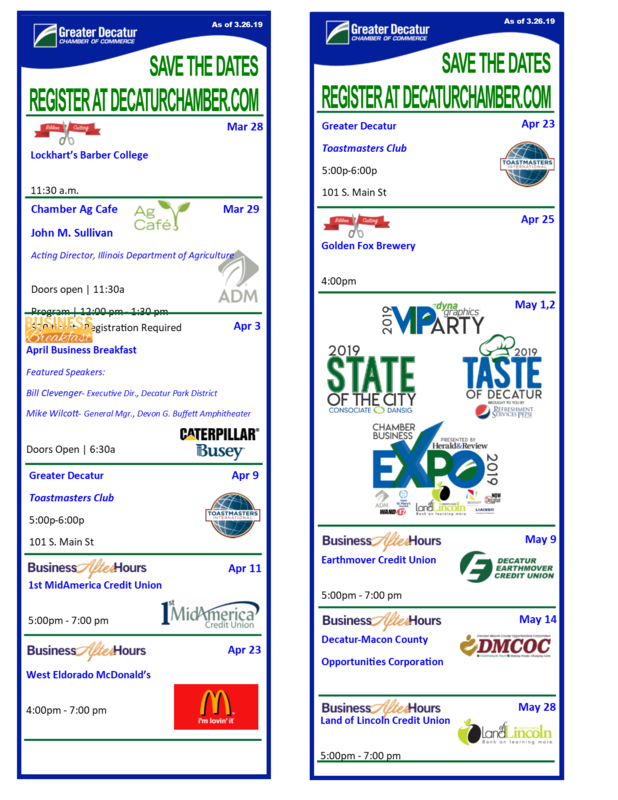 Represent the Interest of Business in Government | The chamber is the leading advocate for businesses in the Decatur and Macon County area. By adding your voice to the alliance of companies representing more than 35,000 people, you help engage local and state officials and lobby on behalf of pro-business interests. The chamber monitors and evaluates legislative changes and public policy that encourage vitality throughout our broad-based business organizations. We aim to create and sustain a favorable business environment for all business to grow and prosper, regardless of industry or business size. Promote the Community and Business Sector | The chamber recognizes that the success of the business sector and the success of the community are directly linked. Partnering with the chamber positions your company as part of an organization recognized for credibility. As “The Voice of Business”, we are the catalyst to develop, promote and support a diverse business community. We also work directly with our member businesses and local organizations to attract and retain a new generation of employees. Provide Leadership Development and Networking Opportunities | The chamber provides opportunities for you and your employees to connect, learn, and grow. Whether your intent is to develop business partnerships, expand your market, better understand the needs of current businesses, or just to become more recognized in the community, you will find a chamber venue to make lasting connections—and have fun doing it. We work hard to help increase productivity, boost morale and achieve new levels of personal and professional success.